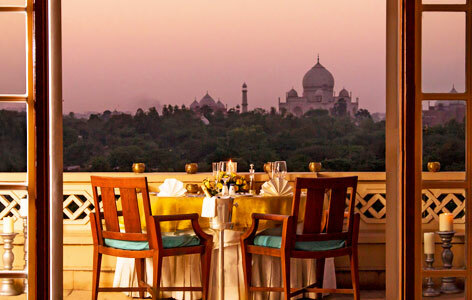 "One of the best hotels in Agra, Oberoi Amarvilas provides a fascinating stay to each of the because of the views of Taj Mahal that are visible from the hotel. Located strategically, just minutes away from the magnificent structure, each of the room captures the monument in its utmost glory and spectacle. 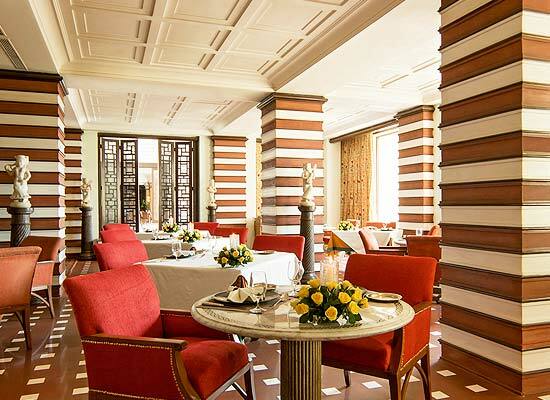 In this heritage style hotel of Agra, romance takes on a new turn and goes on a new level! 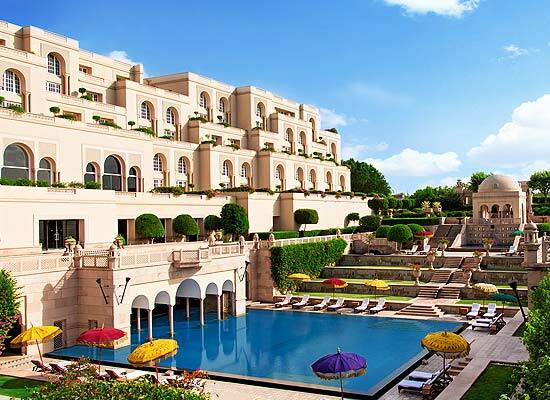 The beautiful luxury resort in the heart of Agra, Oberoi Amarvilas is constructed using traditional feature and elements of ancient Mughal and Moorish architecture. With terraced lawns, magical fountains, serene reflection pools and finely decorated pavilions, the hotel’s interiors are true spectacle. Each step inside the hotel takes one back to the royal days of that Princes and Emperors. Premier Rooms: These rooms are designed using Burma Teak flooring which gives them special elegance and style. Premier Rooms with Balcony: These rooms are similar to Premium Rooms but feature an additional balcony. Deluxe Suites: These spacious suites are furnished with specially crafted furniture and fabrics and offers picturesque sceneries. 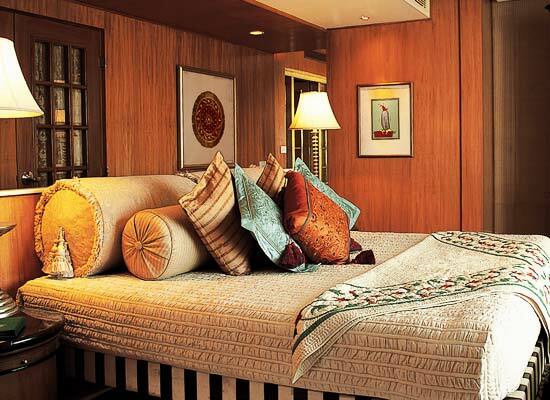 Deluxe Suite with Balcony: These suites are similar to Deluxe Suites but feature an additional balcony. Luxury Suite: These elegant and spacious suites with additional living room and dining room provide a cozy family stay. Kohinoor Suite: The 3000 sq. 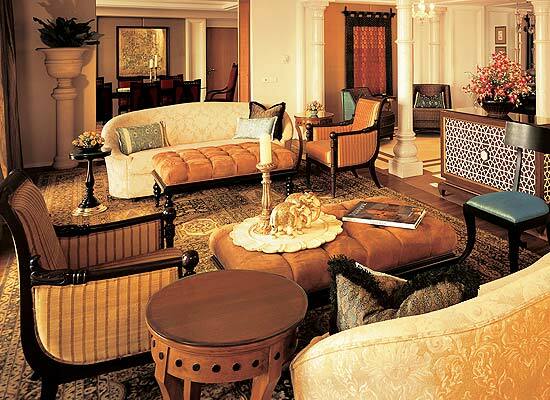 ft. suite is like the Kohinoor Pearl of the hotel and provides the best possible stay in Agra. Bellevue: The all-day dining restaurant in the hotel serves several Indian and International cuisines featuring delights from all around the world to keep every food critic on its toes. Esphahan: The top-rate Indian restaurant of the hotel excels in providing delicious fares from all around the country. Bar: The guests at the hotel serve excellent range of alcoholic and non-alcoholic beverages along with Cigars to guests along with magnificent view of Taj Mahal. Lounge: The on-site lounge is a fine place to enjoy wide range of light beverages along with finger food. The city of Agra in Indian state of Uttar Pradesh is country one of the most populous cities. Tourists from all parts of the world flock the city all round the year because of the presence of three UNESCO recognized World Heritage Sites in Agra, namely, Agra Fort, Fatehpur Sikri and Taj Mahal. The Taj Mahal in Agra is one of the Seven Wonders of the World and is regarded as the ultimate Symbol of Love.